It all started yesterday when we were working on the fuel-in-the-water-tank issue. We have satisfied ourselves that the small amount of diesel that accidentally got into our primary water tank has now been flushed and we're ready to begin using the tank again. Boards lifted to expose the tanks also expose cleaning opportunities! But... that tank seemed to be pumping air into our waterlines. We've been chasing a phantom problem with air in the lines but have been unable to find the culprit. This morning, we began the dual purpose project (from hades) in which we 1 - search for and repair the connection that was sucking air, and 2 - gave the v-berth a thorough once over in preparation for guests arriving tomorrow. Since it was a sunny day, this prompted a side project of cleaning the cockpit and drying wet stuff from the deck storage bags out on the deck. That done, we returned to the original project and began taking things out of the v-berth and found that the walls in the v-berth were WEEPING! There was condensation running down on both sides as well as dripping from every port and hatch. It wasn't bad, just major dampness with pockets of wet. 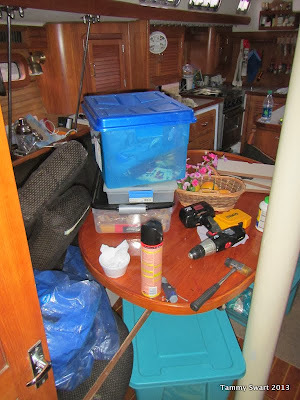 We dragged more stuff out onto the sunny deck to dry, and what wasn't wet got strung out all over the saloon. We unscrewed about 50 screws to lift the board covering the fuel and water tanks under the bed in the v-berth. Of course... all but ONE of the screws came right out. There's always that ONE screw that will NOT come out. Bruce spent a half hour getting it out. Finally success! We lifted the board to see the tanks and connections beneath. We found the faulty connection! This is the first time we've had this board up and so of course it exposed another cleaning opportunity. There were also some tiny bugs (don't even BREATH the word termite) that got the RAID treatment... I treated the area with tea tree oil to stop mildew and OK, now we're ready to work. It was easy to figure out where the air was coming from by shining a flash light on the hoses to see where the bubbles began. There was a T-fitting splitting off of the primary tank. The bubbles began with a hose coming off the right side of the T connected to a small hose with NO clamp!!! Following that tiny tube, we found it to be the fill hose from the water maker that is not currently working. The decision to bypass that was an easy one. Bruce put an elbow on the hose and clamped it on nicely... no more bubbles! Another hour of cleaning and mildew treatment of the weeping walls and cedar closet... Oh did I forget to mention that in tracing the small tube through the closet, we found the walls weeping in there too, causing more stuff to be stacked out on the sunny deck!!!? Yeah... we did. Well, thankfully we still have another 24 hours before our guests arrive... we're drying things out and putting them back in order with the satisfaction that we discovered all of these things before they became REAL problems. Oh, and the newly quiet running water pump is in itself a reason to stop the weeping! Did you find the cause of the weeping walls?